College students design a plan to protect a Norfolk, Virginia community from sea level rise. 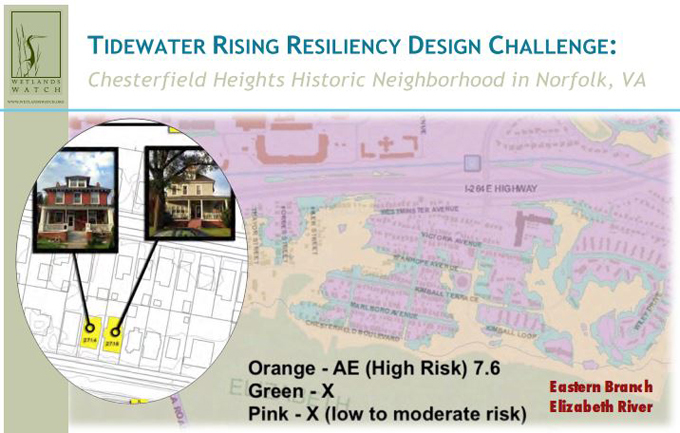 Students from Old Dominion and Hampton Universities in Norfolk, Virginia were asked to create a design to help one local neighborhood adapt to sea-level rise. They searched for an off-the-shelf design that they could modify for the specific needs of Chesterfield Heights, but came up empty. Skip Stiles of the nonprofit Wetlands Watch, who organized the effort, says that’s because most designs are more reactive than proactive. So the students started from scratch, analyzing ideas like living shorelines and rainwater cisterns to create a package of low-cost, high-impact techniques to control flooding. Their work might result in more than just a grade. If implemented, the upgrades will make Chesterfield Heights a drier and healthier place to live.